Pumpkin muffins are delicious and healthy. I tend to think of these as a fall seasonal treat, but the truth is that with canned pumpkin, you can enjoy these easy muffins all year round. These muffins are healthy too, studded with raisins and chopped nuts. Plus the recipe only has 1/4 cup of sugar for 12 muffins. See tips and nutritional information below. In a large bowl, mix together the flour, sugar, baking powder, salt, cinnamon, cloves and nutmeg. Stir in the raisins and chopped nuts. In another bowl, beat together the milk, pumpkin, egg and oil until the mixture is smooth. Add this to the dry ingredients. Stir it together just until everything is moistened. Bake in a preheated 400°F (200°C) oven for 20 minutes or until the muffin tops spring back when they are lightly touched. You can also test doneness by inserting a toothpick or thin metal tester into the muffins. When it comes out clean, they are done. 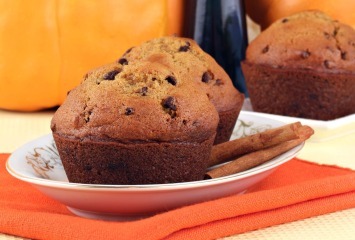 This pumpkin muffin recipe can easily be doubled. I often bake a double recipe, then freeze the muffins for a great snack or breakfast whenever you want. The recipe calls for pecans but chopped walnuts are perfect in the muffins too. Replace half or all of the flour called for in the recipe with whole wheat flour for added nutrition and fiber. When using whole wheat flour for baking it is always a good idea to sift if first for added lightness. If you have access to fresh pumpkin when it is in season, cook it up and freeze it in 1/2 cup baggies. Then you can easily whip up this treat any time, with fresh cooked pumpkin. No fresh pumpkin? Not a problem. Canned is just fine and tastes great. Pumpkin comes from the same family of vegetables as squash, cucumber and cantaloupe. It is naturally low in calories with just 26 calories in 100 grams (just under 1/2 a cup) and has lots of dietary fiber, vitamins and minerals. Pumpkin is a nutritional powerhouse. It is extremely high in Vitamin A, a natural anti-oxidant and is also a great source of B-complex vitamins like niacin, B6 and folate. It is also a good source of Vitamins C and E.
Although pumpkin is extremely healthy for us, we seldom eat it unless we have it in pumpkin pie. This recipe is a great way to get more pumpkin into your diet. It’s also a great way to get kids to eat more vegetables, hidden away in a delicious muffin treat. I have marked this as one of our diabetic recipes, because it is quite low in sugar, it has other healthy ingredients and the carb count isn’t too bad. That said, you can replace the sugar with coconut sugar for an even better diabetes diet recipe. That’s what I do when I make these. If you love these pumpkin muffins, you will want to try our pumpkin bread too. Find it here.